Possibly the oldest recorded team sport in history, the first polo matches were played over 2,000 years ago in Persia. It was quickly adopted by Kings and Emperors, thus becoming known as “the Sport of Kings.” A bit elitist to say the least, but contrary to popular belief, you don’t have to have a trust fund or fancy title to play the game. I don’t have either, and I even played wearing jeans (gasp). 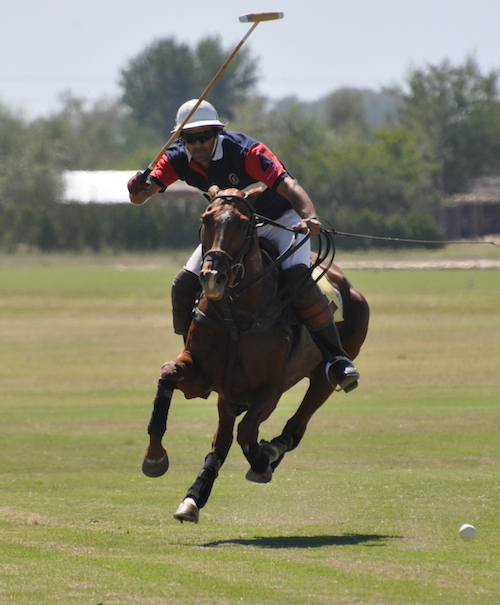 After someone in Persia realized that going around on horseback and hitting a ball with a long stick was quite fun, the sport of kings slowly made its way to the British cavalry and Argentine gauchos many years later. 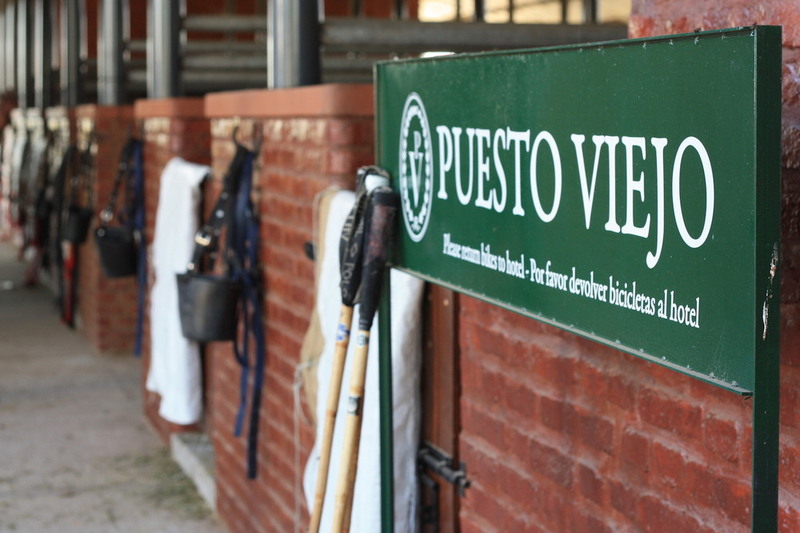 Polo season begins towards the end of September each year, and I’ve been a lucky commoner to attend a tournament in the most stylish district in Buenos Aires. Palermo is known as the cathedral of polo with 45,000 people flocking to watch the drama on the emerald turf in the midst of the skyscrapers right in the center of the city. 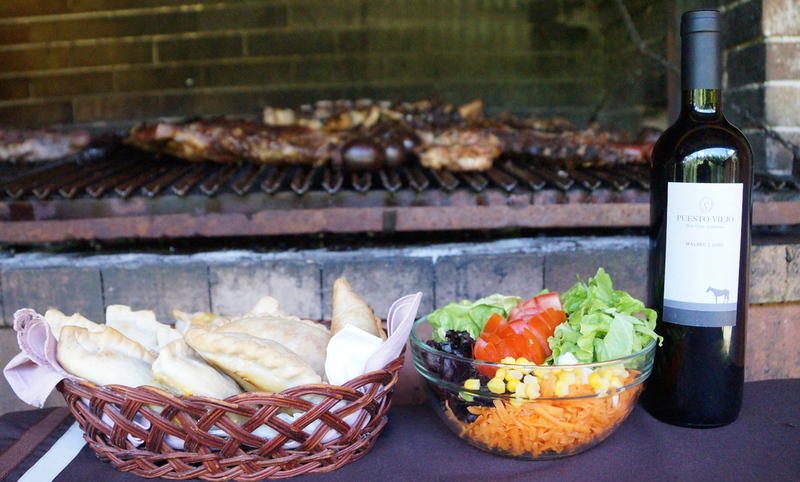 I viewed it as a spectator sport, until I made a visit to Puesto Viejo Estancia. 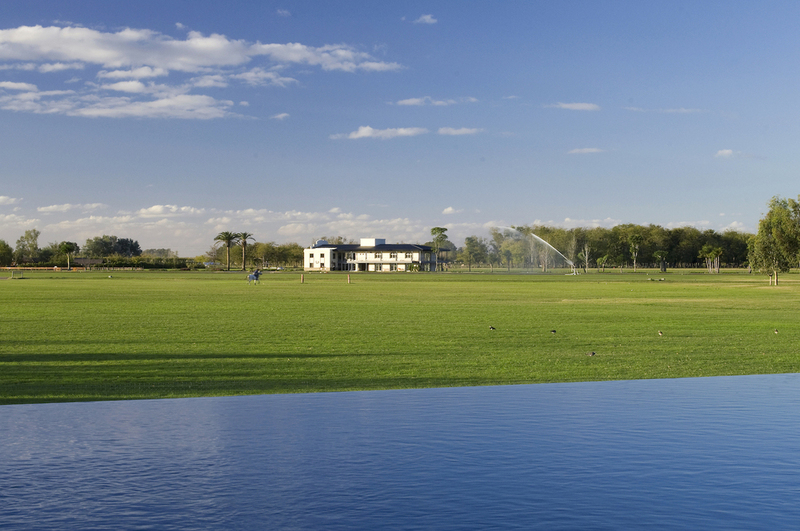 There are polo clubs, and then there are polo clubs. 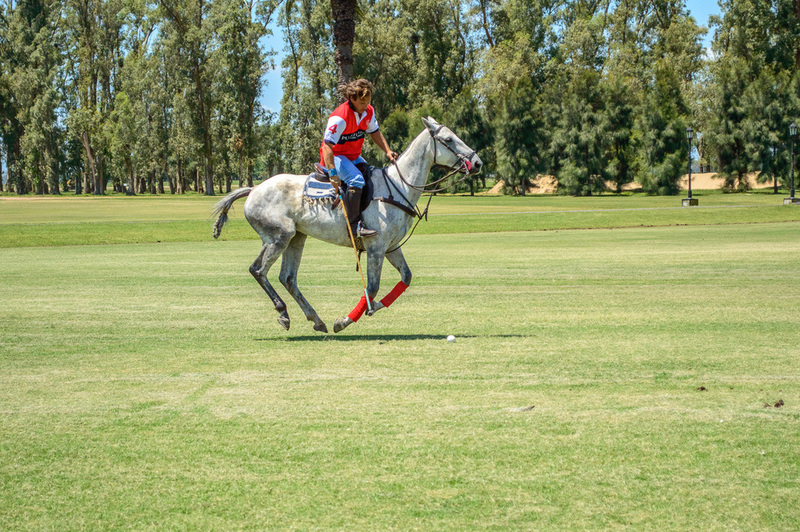 I was invited to Puesto Viejo for a lesson by one of the few women polo players in the country, Lorena Palacios, and her teacher, Julito Casares. I gladly accepted, thinking what’s the worst that could happen? I fall off a horse, break an arm and/or leg…happens more often than not, right? Not on Julito’s watch. 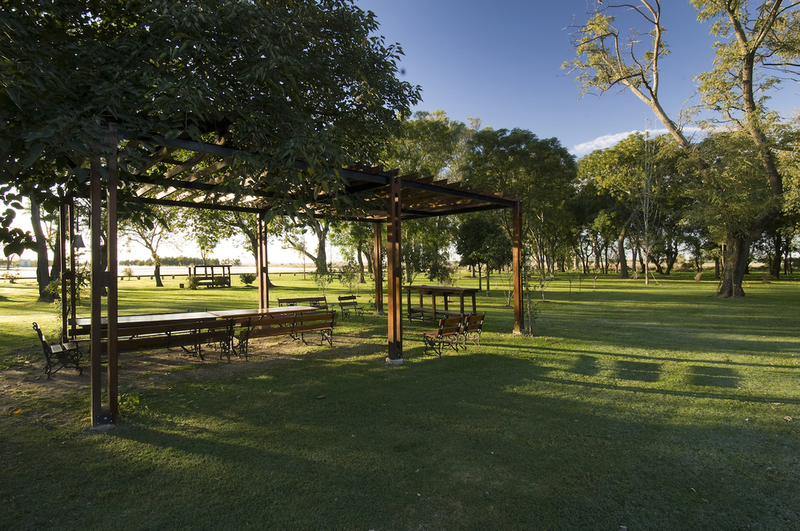 The pristine, sprawling grounds and welcoming atmosphere of Puesto Viejo make it an ideal starting point for a beginner such as myself. It’s so casual, in fact, that I showed up to everyone playing polo in jeans! Thankful I didn’t go buy white trousers before the big day, I was also glad I didn’t have to compete (or be seen) by the professionals of the sport as their match was being played in the distance. Phew. Julito proved to be the perfect tutor as he trotted beside me on his white stallion donning bright red polo leg wraps to match his bright red (dare I say, a Ralph Lauren Polo?) shirt. He definitely looked the part, and try as I may with my Argentine soccer jersey, I felt a bit out of place here on the polo field. Trying to conjure up my best hand-eye coordination in order for my long mallet to hit the ball, on the ground, underneath my horse, I did exactly as Julito told me: Take the mallet in your right hand, twist your body to the far right of the horse, turn your right leg out, bend down and let the weight of the mallet and gravity take over. Mmm hmm, sure, yeah…sounds super easy until you’re mounted high on a horse trying to make contact with a teeny tiny ball, all the while trying not to fall off. Lucky for me, I couldn’t get my horse to go faster than a walk, or crawl rather, so falling off wasn’t really in the realm of possibilities. You can see here where I take an aggressive approach to smacking the ball, however the horse beneath me might as well have been taking a leisurely walk near a peaceful pond. Let’s be honest, that’s probably what I needed. 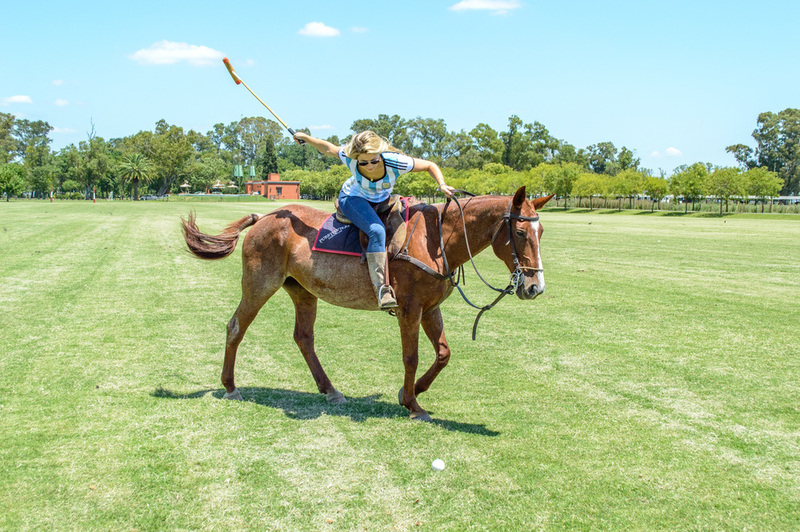 To gallop, swing, hit and stay on a horse your first time playing Polo? Nah. I’ll leave that for round two and let my sore right arm heal in the interim. 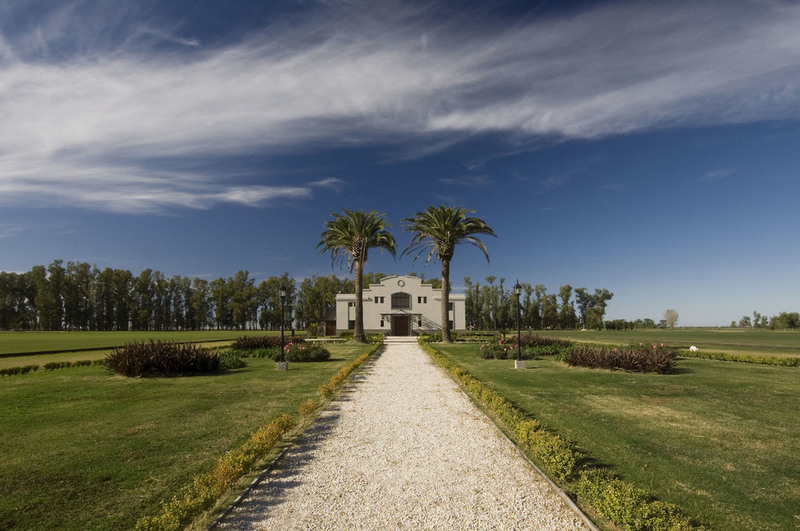 Sipping post-practice glasses of Malbec, we toured the grounds and had a delectable meal with polo star Santiago de Estrada, a 6-goal polo player and coach based in Buenos Aires. 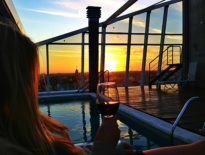 The unique dichotomy between the bustling city of Buenos Aires and the tranquil campo (or country) affords Santiago the best of both worlds. He can take off from his Recoleta apartment and drive an hour outside of the smog, traffic and hoards of people to end up here. Talk about the good life. Where can I sign up? The man is an interesting breed. When I asked him about his biggest accomplishment to date, Santiago didn’t say his degree in International Foreign Trade, nor did he mention traveling all over the world whilst winning polo matches in various destinations. He really couldn’t even answer the question. He’s humble but proud of where he came from. He’s adamant that polo runs deep in his blood. He’s also adamant about not being a tourist. 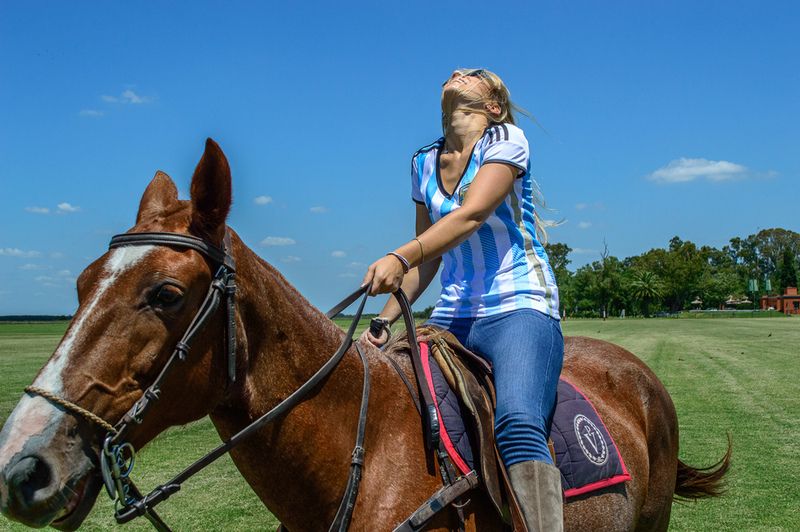 The man has traveled the world by way of polo, but at the end of the day, he prefers being at home in Argentina. 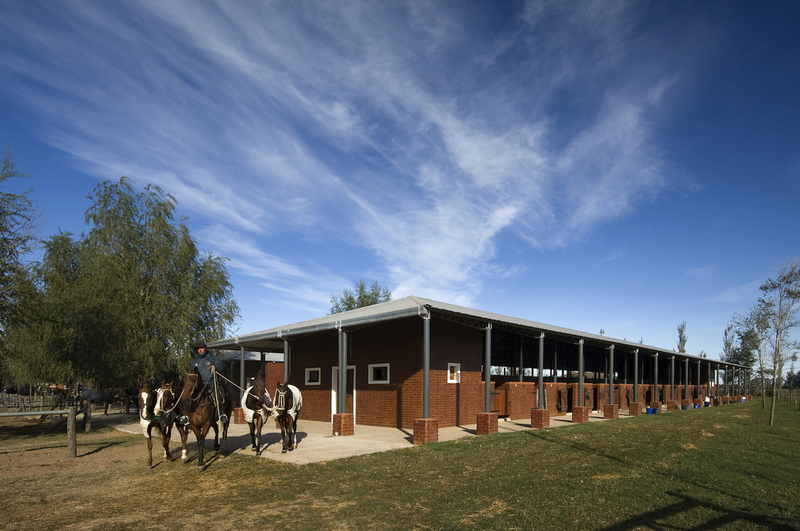 Santiago has 20 years of experience teaching polo players, patrons and beginners, splitting a lot of his time between Argentina and London. When I asked whether he preferred playing or teaching, he paused for a long while. “Players are not teachers,” he said. “But I am.” Apparently it’s a tough gig, but someone’s gotta do it. He claims he’s a real teacher, and likes to teach people who want to learn. He isn’t in it for the money. He’s in it because polo’s in his blood. “In London” he says, “polo is all about the image. I tell everyone: Sell your fancy cars, try not to get married, and actually buy some horses.” He’s just a down-to-earth guy with a love for the game.